After the death of Gautama Buddha (483 b.c.e. ), monks and scholars concerned with practicing the lessons he taught met several times at formal councils at which the canon of Buddhist thought was established, the rules of monastic life were agreed, and matters of dogma and ideology were debated and confirmed. 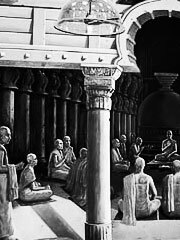 The first Buddhist council was held soon after the death of the Buddha under the patronage of king Ajatasatru, and presided by a monk named Mahakasyapa, at Rajagaha (today’s Rajgir). Its objective was to record the Buddha’s sayings (sutra) and codify monastic rules (vinaya). The second Buddhist council was convened by king Kalasoka and held at Vaisali, following conflicts between the conservative and liberal elements of Sangha. The conservative schools insisted on strict adherence to monastic rules (vinaya). The secessionist Mahasangikas argued for more relaxed monastic rules, which could appeal to a large majority of monastic and lay people (hence their name «majority» assembly). The council ended with the rejection of the Mahasanghikas. They left the council and maintained themselves for several centuries in northwestern India and Central Asia according to Kharoshti inscriptions found near the Oxus and dated c. 1st century AD. In time, up to 18 schools of the traditional Buddhist thought arose, the only remaining one today being the Eastern Theravada school. Other schools included the Sarvastivadin and the Dharmaguptaka in Northwestern India. The third Buddhist council was convened by the Mauryan king Ashoka (260–218 BC) at Pataliputra (today’s Patna), and held by the monk Moggaliputta Tissa. Its objective was to reconcile the different schools of Buddhism, and to purify the Buddhist movement, particularly from opportunistic factions which had been attracted by the royal patronage. The responses to doctrinal questions and disputes formulated at the Third Council were recorded by Moggaliputta Tissa in the Kathavatthu, one of the books of the Abhidhamma Pitaka. The Pali canon (Tipitaka, or Tripitaka in Sanskrit, lit. the «Three Baskets»), which are the texts of reference of traditional Buddhism and considered to be directly transmitted from the Buddha, was formalized at that time. They consist of the doctrine (the Sutra Pitaka), the monastic discipline (Vinaya Pitaka) and an additional new body of subtle philosophy (the Abhidharma Pitaka). Also, emissaries were sent to various countries in order to spread Buddhism, as far as the Greek kingdoms in the West (in particular the neighboring Greco-Bactrian Kingdom, and possibly even farther to the Mediterranean according to the inscriptions left on stone pillars by Ashoka). After 250 BC, the Sarvastivadin (who had been rejected by the 3rd council, according to the Theravada tradition) and the Dharmaguptaka schools became quite influential in northwestern India and Central Asia, up to the time of the Kushan Empire in the first centuries of the common era. The Dharmaguptakas were characterized by a belief that Buddha was separate, and above, the rest of the Buddhist community. The Sarvastivadin believed that past, present and future are all simultaneous. They may have contributed some formative influence to Mahayana. The fourth Buddhist council was convened by the Kushan emperor Kanishka, around 100 AD at Jalandhar or in Kashmir, and is usually associated with the formal rise of Mahayana Buddhism. Theravada Buddhism does not recognize the authenticity of this council, and it is sometimes called the «council of heretical monks». It is said that Kanishka gathered 500 Bhikkhus in Kashmir, headed by Vasumitra, to edit the Tripitaka and make references and remarks. It is said that during the council, there were all together three hundred thousand verses and over nine million statements compiled, and that it took twelve years to complete. This council did not rely on the original pali canon (the Tipitaka). Instead, a set of new scriptures were approved, as well as fundamental principles of Mahayana doctrine. The new scriptures, usually in the Gandhari vernacular and the Kharosthi script, were rewritten in the classical language of Sanskrit, to many scholars a turning point in the propagation of Buddhist thought. The new form of Buddhism was characterized by an almost God-like treatment of the Buddha, by the idea that all beings have a Buddha-nature and should aspire to Buddhahood, and by a syncretism due to the various cultural influences within northwestern India and the Kushan Empire, especially from Zoroastrianism and Greco-Buddhism. From that point on, and in the space of a few centuries, Mahayana was to flourish and spread into Central Asia, China, Korea and Japan (introduction of Buddhism in 538 AD). The Fifth Council took place in Mandalay Burma now known as Myanmar in 1871 in the reign of King Mindon. The chief objective of this meeting was to recite all the teachings of the Buddha and examine them in minute detail to see if any of them had been altered, distorted or dropped. It was presided over by three Elders, the Venerable Mahathera Jagarabhivamsa, the Venerable Narindabhidhaja, and the Venerable Mahathera Sumangalasami in the company of some two thousand four hundred monks (2,400). Their joint Dhamma recitation lasted for five months. It was also the work of this council to cause the entire Tipitaka to be inscribed for posterity on seven hundred and twenty-nine marble slabs in the Myanmar script after its recitation had been completed and unanimously approved. This monumental task was done by some two thousand four hundred (2,400) erudite monks and many skilled craftsmen who upon completion of each slab had them housed in beautiful miniature ‘pitaka’ pagodas on a special site in the grounds of King Mindon’s Kuthodaw Pagoda at the foot of Mandalay Hill where it and the so called ‘largest book in the world’, stands to this day. The Sixth Council was called at Kaba Aye in Yangon, formerly Rangoon in 1954, eighty-three years after the fifth one was held in Mandalay. It was sponsored by the Burmese Government led by the then Prime Minister, the Honourable U Nu. He authorized the construction of the Maha Passana Guha, ‘the great cave’, an artificial cave very like India’s Sattapanni Cave where the first Buddhist Council had been held. Upon its completion The Council met on the 17th of May, 1954. As in the case of the preceding councils, its aim first objective was to affirm and preserve the genuine Dhamma and Vinaya. However it was unique in so far as the monks who took part in it came from eight countries. These two thousand five hundred learned Theravada monks came from Myanmar, Cambodia, India, Laos, Nepal, Sri Lanka, Thailand and Vietnam. The late Venerable Mahasi Sayadaw was appointed the noble task of asking the required questions about the Dhamma of the Venerable Bhadanta Vicittasarabhivamsa who answered all of them learnedly and satisfactorily. By the time this council met all the participating countries had had the Pali Tipitaka rendered into their native scripts, with the exception of India.